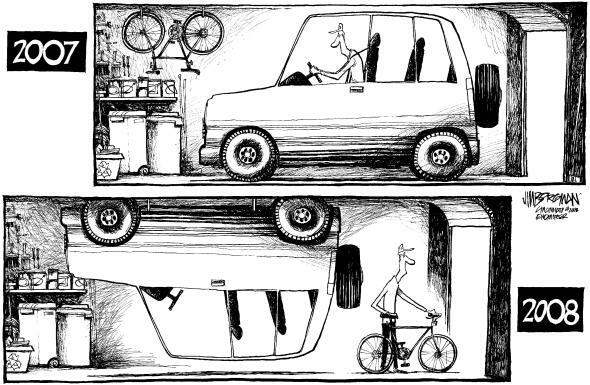 Here is a bicycling/commuting comic by Jim Borgman that appeared in the Oregonian. And, ya know, gas is now about $4.00/gallon…….. This entry was posted in Comics on May 27, 2008 by golinielcomblog. 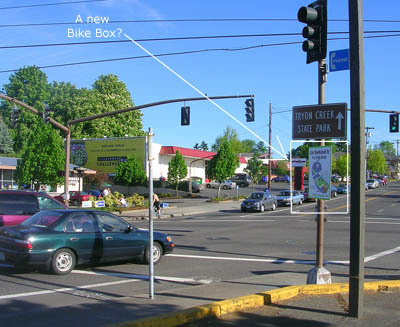 I was surprised to see this sign announcing the coming of a new bike box, while approaching the intersection of Taylors Ferry and Terwilliger, on my latest bike ride to work. I admit I was also a little baffled as to the importance of installing a bike box on this intersection. Yes, I am a cycling advocate, and I realize that there is a fair bit of bike traffic on this road. I am just not convinced that there is enough bike traffic, nor is there a more than significant danger to cyclists that can be alleviate the risks. I am pretty sure that this will require a restriction to right turns for the 3 lanes that currently have that option. Which will further back up traffic, cause confusion, and will simply be disregarded by some drivers anyway, which, since they will be turning from farther back in the intersection, will only serve to cause more danger to everyone around them. The first bike box I saw, was the one on Madison, just off the west approach to the Hawthorne bridge. We were on our bikes at the time. When we got there, a car was stopped at the light, in the middle of the box. I think the boxes are a great try and it does raise driver awareness a bit. I am just not convinced its the right answer. The Portland Tribune just had a good article on bike boxes. This entry was posted in Bicycling & Fitness on May 19, 2008 by golinielcomblog. So you are going to be a Clackamas County juror? I recently got my fourth summons to serve a term as a juror in Clackamas county. I feel sort of targeted in a way. I am not sure just how the seem to select me so often when others I know have never been selected. I am just popular. Don’t disparage if you have been selected, for if you know what to expect, the experience can be pretty interesting. The summons comes with most of the information you need to know to make your arrangements. Even instructions on how you might get out of serving your duty. On my second summons, my employer insisted that I submit the requests to be excused. And while the county agreed, I don’t recommend this tact. One of the first things you do as a juror, is to see a patriotically inspiring video as to why this is your duty. I don’t have anything to add to that argument. You can ask that your duty be postponed, as I did on my third summons. They even give you a chance to say what date is the first available one that will work for you. Be aware that it is likely, like it my case that they will likely serve you again on that first available week. I don’t think they will just forget about you. If you do get selected to go in to a trial, you will likely first go through a period of questioning where the attorneys try to figure out if you are going to be the right person.Â After the questions, you all are excused while they figure it out and come back with the final selections for the trial.Â I’m not offering any advice on what to say to get out of duty.Â The questions and answers are straightforward.Â You are either in or out, based on your history. One guy in the last trial seemed to try very hard to get convince them he wasn’t the right guy.Â He got picked anyway. On my first term, the county asked that you come in each day of the week and wait to be assigned or released. I served on two trials in that week. Since that time, they have gone to a system where you call in each night to see if you are needed the following day. On the third term I didn’t get called in til Thursday, and was released after waiting there most of the day, with out ever being called to a trial. My fourth and most recent service, I was called in on Thursday again, and got selected by 9:30 am for the first trial of the day. The summons does say that parking is limited. In fact,Â they will tell you the closest free parking is behind the West Linn police station. Yea, a little weird to hear them say that if you want to park for free, you have to do it in the next town. But really, the station is just off the West LinnÂ side of the Oregon City bridge, and the court buildings are about 3 blocks off the Oregon City side, so its not a bad walk. I chose to ride the bike, to save driving and parking.Â Oddly enough I could not find any bike parking racks on the courthouse block.Â There was one at the McMennamins on McLoughlin, and one small one on the sidewalk the next building over. Hmmm, this is a public building right? Heres a tip. Read the address on the summons.Â The jurors assembly room is no longer in the courthouse building,Â so dont unpack an remove all your metal accessories and try to get in to the courthouse first thing in the morning.Â The guard there will sternly instruct you that you must go next door.Â I think he has done that a lot, and is likely tired of people not able to read addresses and follow simple instructions. Anyway the room next door is bigger and newer and much nicer.Â This will become important if you have to spend much time waiting in it, with 50 other people. The court is willing to pay you $10.00 for your day in court.Â Somehow, I just wasn’t interested. I waived it. They do give you a cool jurors button you have to wear all the time, so everyone can stare at you, but no one can talk to you. The button does get you a 20% discount for drinks and lunch at the Subway and the coffee shop across the street.Â So that was cool. Only bottled water in clear bottle is allowed in the courthouse. She also announced to us, that if the bottles were not sealed, you may be asked to drink from them to prove it is water and not some dangerous substance. hmmm. Don’t buy your water in the machines at the jury room.Â One lady paid 1.30 for hers.Â Across the street, and with my discount, I was out just .80 cents.Â That’sÂ a .50 cent savings right there. This entry was posted in Social on May 13, 2008 by golinielcomblog. 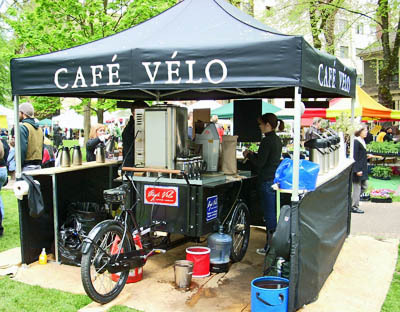 Cafe Velo and the Portland Farmers Market. Saturdays errands included riding the bikes to Friends of the Ledding library plant sale in Milwaukie, and then to the Farmers Market in the courtyards of Portland State University. We like to support the library and since we got there late, all their plants were half price, and CD’s just 2.00 each!Â The Portland Farmers market is a great place to get fresh and local supplies.Â In this trip we were able for find some great cheeses, blackberry honey, crab meat, and vegetables.Â We also spotted the Cafe Velo setup.Â A coffee shop that arrives as a bike and expands into a coffee shop.Â Its an impressive setup, but I am thinking I don’t want to pedal it up too many hills. Rick Wilson, the guy who started a bakfiets blog back in 2006, has turned his passion for the Dutch cargo bikes into CafÃ© VÃ©lo, Portlandâ€™s first bakfiets-based business. Wilson has just finished customizing his new, industrial-sized cargo bike and he plans to pedal it to the farmerâ€™s market twice a week. Itâ€™s large enough to carry everything he needs to set up a booth to sell coffee drinks. You can catch Wilson at the Portland Farmers Market on Wednesdays (South Park Blocks) and Saturdays (at Portland State University). This entry was posted in Bicycling & Fitness, Portland, Or, Oregon on May 11, 2008 by golinielcomblog. How do I decide if I need a digital convert box? Our son T is our has lots of expertise in retail electronics. Iâ€™m sure youâ€™ve heard by now that next year (midnight on February 17th) major TV stations will be changing from an Analog signal to a Digital one and how older TVs will need a Converter Box to continue to receive a signal. However, many of you may have questions about your TV and the switch, and hopefully I can answer some for you. Do you have cable, satellite, dish, or some other form of pay-for-TV service? Have you bought a TV with a digital tuner* in the last year? *more on that later, if youâ€™re unsure, keep reading. **if you occasionally use it to watch a TV broadcast, you may want to keep reading. If you answered yes to any of those questions, you DO NOT need a converter box, your TV will continue to function properly, and you should STOP READING (unless youâ€™re truly interested or still not sure). If you have cable, satellite, dish, or some other form of pay-for-TV service you DO NOT need a converter box. An antenna and a digital tuner are required to receive over the air broadcasts (e.g. channels 2, 4, etc.). If your TV has a digital tuner you may continue to use your existing antenna; however, a digital antenna will give you a better signal. If you purchased a TV within the last year, chances are that it already has a digital tuner in it, especially if it is an LCD or Plasma TV. To verify if your TV has a digital tuner, check the TV set itself, the box it came in, the instruction manual, or the manufacturerâ€™s website; look for â€œdigital tuner,â€ â€œdigital input,â€ or â€œATSCâ€ [a type of tuner]. If it HAS a digital tuner and DO NOT have cable, satellite, dish, or some other form of pay-for-TV service, you DO NOT need a converter box, just an antenna. If it DOES NOT have a digital tuner, and you DO NOT have cable, satellite, dish, or some other form of pay-for-TV service and are NOT going to subscribe in the future, you DO need a converter box and an antenna. The Government has put in place a program to offer coupons to households to help cover the cost of the converter boxes (theyâ€™re $50). Each household is eligible for 2 coupons, valued at $40 each. To request the coupons, apply online at www.dtv2009.gov or call 1-888-DTV-2009 (1-888-388-2009). You must apply by March 31st, 2009. I suggest you apply if you donâ€™t have cable, satellite, dish, or some other form of pay-for-TV service; or even if you do, but not all of your TVs are hooked up to it. Even if you donâ€™t watch TV much, it is still a good investment; $9.99 isnâ€™t that much to pay, all things considered. This entry was posted in Tivos & Other Technology on May 10, 2008 by golinielcomblog. Taking the trailer on bike rides. - Ron White describing an arrest after having one or two, too many. 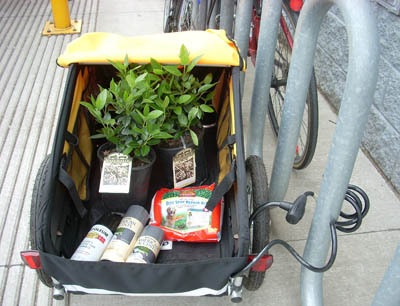 We take the burley bike cargo trailer along for many of our urban rides. Even on rides we do just for fun. Some times we need it, sometimes we don’t. I have documented some of those trips with the Burley here. One day last week we got a few things from Lowes. There are at least three reasons for taking the trailer, even when I may not need it. 1. I believe drivers give you a little more respect, courtesy and wider berths while towing something with your bike. Riders using their bike for some utilitarian purpose tend to be more responsible, predictable and are in some way proving their worth to those drivers who don’t believe bikes have this right. So, anything to make our rides safer is a good thing. 2. Towing the trailer adds resistance, which adds to the overall exertion and workout level of my ride. In that way even rides of short time or distance effectively seem longer. This entry was posted in Bicycling & Fitness on May 6, 2008 by golinielcomblog.